A week ago, we completed another retreat where we talked about the benefits of conscious aging as a spiritual practice, and four major obstacles that commonly undermine it. Then we talked about ways to overcome that typically undermine our own well-being as we age. One thing we didn’t talk about, however, was the social taboo against talking about things really important to us individually. We simply and naturally found ourselves naturally breaking that taboo as the spirit of this group of new and more experienced sojourners was led to talk about their issues, concerns, and needs. When we askedm “what is your major take-away from our events?” a recurring theme over the years has been the opportunity “to talk about the things we never get to talk about.” This time one participant named “that people want to talk” about those things as an important new awareness (my emphasis). Over the years I’ve learned the benefit of this kind of sharing both personally and professionally. When I am engaged in conversation with another who shares my own questions and concerns, hopes and fears, as well as some of my life experiences, that is when I’m personally able to hear the Spirit of life whispering its loudest to me. This almost inevitably invites me to a deeper level of trust: to be open to the wisdom of the other who is also seeking a fuller, richer, better experience of everyday living. My experience of this whispering is unique only in the manner, style, and content of what my spirit says. More to the point, personally and professionally, I’ve learned the greater the participation the greater the benefit. As an introverted man who likes to remain in his own thoughts, I’ve learned that I learn more and better from expressing my thoughts than by keeping them in. Which is also why I encourage people not to just sit back and listen, but to actively engage in our discussions; speaking when and as they feel able and comfortable. Which is why we offer a variety of ways to encourage that. Sadly, as individuals we have lost a great deal of opportunity to talk about things that don’t conform to superficial social or cultural expectations and niceties. Most people who ask “how are you?” don’t really care how we are, so don’t expect an honest answer; and certainly not any deep response. When NEW FUTURES asks, we want to know, and we wait for an answer—as deep as you care to venture. That is why our retreats are intentionally structured to provide lots of opportunity to talk about those things we usually don’t get to talk about. Participants repeatedly tell us they appreciate that opportunity. Indeed, someone named “group participation” as the most helpful part of our recent event for her or him. On May 11 we will be offering another opportunity for interested people to talk. 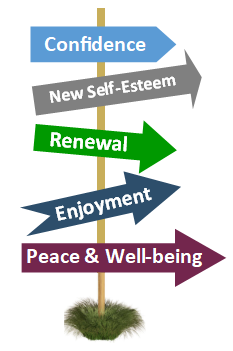 Our focus then is on the “practical” utility of 8 Keys to Fulfillment in Life’s 2nd Half. Details and registration are on this website. You are invited. We hope to see you, and talk with you … which is different than talking at you.